When a company announces on January 4 that it has signed 14 new golfers, then abruptly pulls out of the equipment market just seven months later, it’s clearly a drastic decision that’s come down from on high. While there has been much comment by industry observers to the effect that “we could see this coming”, it was clearly news to Nike Golf staff and players, especially the 14 newcomers it announced in January, including Americans Tony Finau and Brooks Koepka. Maybe it will help him achieve his goals, but it won’t be by using their clubs for much longer. The innovation for Tony will all be in the shoe and clothing departments and those flat billed hats, presumably. And marketing. How much forewarning Tiger Woods and Rory McIlroy got about yesterday’s news remains to be seen but given that McIlroy’s team has been working on the renewal of his $100m, five-year contract, due to expire on 31 December 2017, it’s possible they did not get much warning at all from the head of corporate, never mind Nike Golf. What happens now to the new signings? As yet, the state of the post-Nike Golf equipment landscape is unclear and agents are screaming for information. With Nike also pulling out of golf bag and golf ball manufacture, McIlroy’s bag may finally get the commercial sponsor that was the cause of so much angst four years ago, when he was negotiating his five-year deal with the sportswear giant. Initially to be a Nike-free zone with the bag space reserved for a big corporate sponsor, nothing but a swoosh ever made it onto the bag for any considerable length of time (bar charity appearances or the occasional nod to his partners), which means that lucrative piece of real estate may finally be exploited. As for McIlroy’s options, it seems unlikely that he would be delighted to see the back of Nike when he was trying to renew his contract. After all, how many companies are willing to pay you $20m a year and market you all over the world? Then there’s the golf ball. Busy times ahead if you are in the business of managing golfers. High pressure times. 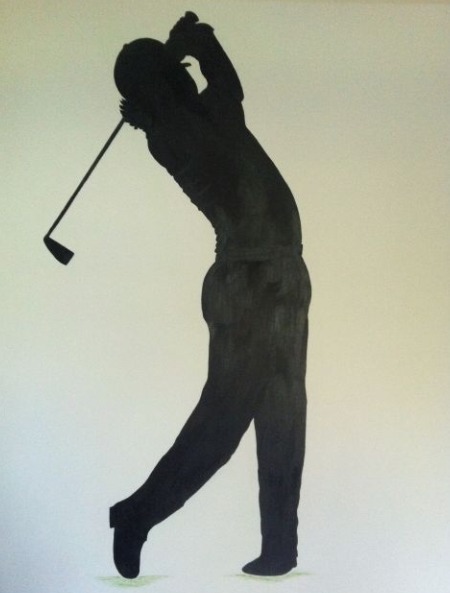 A specially commissioned “Silhouette of Rory McIlroy” by artist Michelle PearsonRory McIlroy has the potential to become Ireland’s first sporting billionaire after signing a deal with Nike that makes him better paid than his boyhood idol Tiger Woods. Rory McIlroy plays his last official round with Titleist clubs in the DP World Tour Championship in Dubai on 25 November 2012. Photo Eoin Clarke/www.golffile.ieFormer World Clubmaker of the Year Derek Murray has penned a fascinating insight into what he believes Rory McIlroy will have in the bag when he makes what is believed to be a $250m move to Nike Golf in 2013. The Foregolf owner predicts a “very smooth” transition but wonders how Nike will cater to McIlroy’s needs in what is likely to be a head-to-toe, through-the-bag deal. GolfCentral Daily’s exclusive pics of McIlroy’s new Nike set up. Picture via www.golfcentraldaily.com/Head over to Donal Hughes’ entertaining Golfcentral Daily blog for an exclusive sneak peak at the Nike set up in Rory McIlroy’s bag for 2013.